The clay-court and grass-court seasons are now behind us, meaning the tennis world turns its attention to the North American summer hard-court season. And that, of course, means the 2014 Emirates Airline US Open Series. The Series title will be decided a little bit differently this year, with players who earn points at three or more Series events doubling their total points. So it’s the more you play, the better your chance of winning. With that in mind, let’s take a final look at who might contend for the 2014 Series crown. Click here for a recap of the men's players to watch in 2014. With all apologies to the next woman on this list, no player has climbed faster in recent years than 20-year-old Canadian Eugenie Bouchard, who improved her ranking from No. 144 at year-end 2012 to No. 32 in 2013 to No. 7 following her runner-up showing at Wimbledon. She is the only player in tennis to reach at least the semifinals at all three Grand Slam events this year and now gets a chance to play on perhaps her best surface, all in tournaments that are just a short flight from her home in Montreal. Simona Halep was a virtual unknown a year ago. That changed when she defeated Caroline Wozniacki and Petra Kvitova to win the 2013 New Haven title. Since then she has been arguably the best player in the world. The 22-year-old Romanian won six titles in 2013 (second only to Serena) and this year has reached the French Open final and the Wimbledon semifinals. Her court coverage is unparalleled, and her counterpunching style will be hard to beat during the 2014 Series. 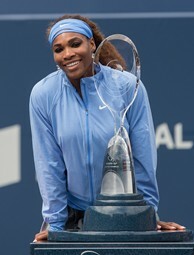 After not cracking the Top 5 during the first seven years of the Series, Serena Williams has become a force over the last three seasons, winning Series titles in 2011 and 2013 and finishing third in 2012. Her hard-court bona fides are also among the best in the history of women’s tennis, with five Australian Open and five US Open women’s singles titles. Shocking early exits this year at the French Open (second round) and Wimbledon (third round) mean Serena will likely enter the summer hungry to re-establish her supremacy. Two-time Australian Open champion Victoria Azarenka was perhaps the most consistent hard-court performer in women’s tennis from 2011 to 2013. Her 2014 season has been short circuited by injuries, but if she can regain her form this summer, a now-healthy Azarenka will be a contender for the 2014 Series title. She boasts three Top 5 Series finishes in her career, including as runner-up in 2013, when she won the title in Cincinnati. Despite being a steady presence in the Top 10, Petra Kvitova had fallen off the radar a bit in recent years. But her run to a second championship at Wimbledon was a reminder of how dangerous she is at her best. And while she struggles on slower courts, the lanky Czech is a force on the quicker ones, which reward her slicing lefty serve. She also knows what it takes to win in the Series, claiming the overall title in 2012 and reaching the New Haven final each of the last two years. Li Na cemented her status as one of the world’s best hard-court players by winning this year’s Australian Open for her second career Grand Slam title. The current world No. 2 also reached the final in Miami earlier this year and advanced to the semifinals at the 2013 US Open. In 2012, she took the title in Cincinnati en route to a second-place finish in the Series standings, her best Series showing. Agnieszka Radwanska has quietly become one of the best hard-court players in the world, with eight titles on the surface in the last three years and a Top 3 Series finish in 2011 and 2013. The 2014 Indian Wells runner-up and Australian Open semifinalist also is a frequent participant in Series events, having played in four of the five women's tournaments in 2013 (highlighted by a runner-up showing in Stanford). Maria Sharapova missed the majority of the 2013 summer hard-court season due to injury, but she is firmly back in the mix in 2014 following her championship run at the French Open. Seven of her last eight titles have come on clay, but Sharapova has an impressive hard-court resume, having won the 2006 US Open and 2008 Australian Open. She also finished in the Top 5 of the Series standings in five of six years from 2006 to 2011. Dominika Cibulkova began the year by reaching the Australian Open final. Her results since have been spotty, but don’t write her off yet. Cibulkova reached the semifinals in Miami and the quarterfinals in Indian Wells, a reminder that she is at her best on hard courts. She is also a consistent performer in the Series, having won two of her four career titles in Series events. Ana Ivanovic, the 2006 Series champion, has quietly re-established herself as a contender, having already won two hard-court titles in 2014 (Auckland, Monterrey). Moreover, the former world No. 1 has reached the round of 16 or better at each of the last six hard-court Slams, and she defeated Serena Williams en route to the quarterfinals at this year's Australian Open. Already a steady presence in the world’s Top 50 – and currently the youngest player in the Top 30 – 19-year-old Madison Keys could soon establish herself as a contender for major titles. Despite her maiden WTA title coming on the grass in Eastbourne in June, the big-serving American is most at home on hard courts, having reached the third round at the 2013 Australian Open and the semifinals in Sydney earlier this year. Sloane Stephens has struggled in 2014, but she still reached the fourth round at the Australian Open and French Open and has a game well-suited to hard courts – and she should benefit from playing the summer season close to home. During the 2013 Series, the 21-year-old American won two matches at each of the events in Cincinnati, New Haven and Toronto.